First Line: The invitation, though embossed on the stiffest 100 percent rag-content paper Gribbley's, Stationers to Her Majesty, could produce, nonetheless had more than a whiff of the prepackaged Marks & Sparks sales offering about it. There are two things that make life worth living for millionaire Sir Adrian Beauclerk-Fisk: writing a succession of bestselling mysteries and threatening his four children with disinheritance. Unfortunately the second item has become rather predictable, so he decides to liven things up a bit. Calling the family together for a dinner, he announces his secret marriage to Violet, a beautiful older woman who was once Suspect #1 in the murder of a previous spouse. The news is incendiary, and within hours the eldest son and heir is found dead. When Detective Chief Inspector St. Just is called in to investigate, the body count rises, and St. Just knows it will continue to do so until he can unravel all the secrets in this very strange family. This is a book which was written with the author's tongue firmly planted in her cheek. 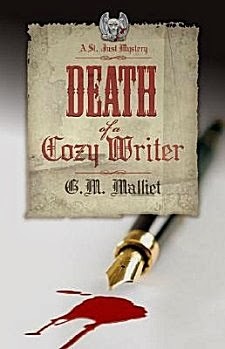 G. M. Malliet must have smiled her way through Death of a Cozy Writer. From Sir Adrian hovering spider-like at the center of his web to each of his flies...er...children dancing on the threads, this book is a feast of wit and laughter. When told that the plot of his book, 12:40 from Manchester, was thought of by Dame Agatha Christie first, Sir Adrian replies, "Of course she did. But my book was better." The man has twisted each of his children so that none of them are likable, but their ill-thought plans and venom-laced dialogue are just plain fun to read. Naturally, what sets this bizarre household to buzzing feverishly is the introduction of a sane man-- Detective Chief Inspector Arthur St. Just. It can be difficult for a rational person to make sense of the completely irrational, and watching St. Just make his way slowly through this house of Bedlam can be a treat. However, I do wish his character had been developed a bit more. If the wit hadn't been so engaging, I doubt very much that I would've read the entire book, but I did love it, so it saved the read.